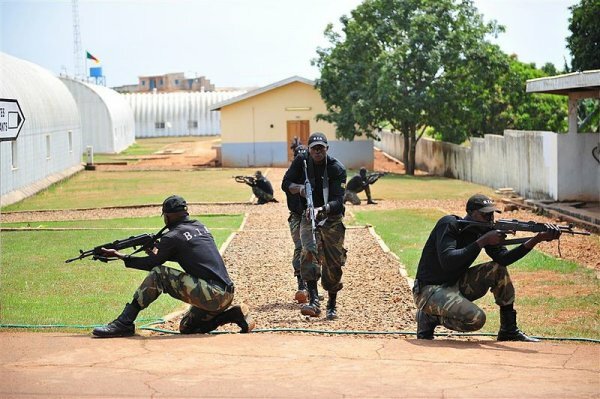 Since 2012, the USA has provided Cameroon with over $220 million in military and security funding, despite repeated reports of human rights violations and atrocities committed by its forces – especially the elite BIR (Battalion d’Intervention Rapide) military guard. BIR soldiers have been accused of burning villages, torture and indiscriminate killing of Anglophone Cameroonians in an attempt to quell the Ambazonian independence movement. The US could apply outside pressure on the state to de-escalate the conflict by using its Leahy Law, which bans military assistance to foreign security forces committing human rights violations. UNPO supports efforts to end the violence and open the way for a peaceful dialogue on Ambazonian self-determination. Since the end of 2016, Cameroonian citizens in the country’s English-speaking regions have been calling for more equitable representation in government and more respect for English—one of the country’s two official languages—in courts and schools. English has been increasingly marginalized, creating a society where knowledge of French is a necessity to attend the country’s top schools, receive government appointments, or conduct business. Anglophones are also protesting the fact that more government resources are allocated to Francophone regions. In 2017, the two Anglophone regions were allocated a combined $153 million of the country’s Public Investment Budget, while the country’s south—the home region of President Paul Biya, who has been in power for more than three decades—was allocated more than $225 million, despite having a far smaller population, according to 2012 data. What began as peaceful protests by lawyers, teachers, and everyday citizens has devolved into a near-civil war. What began as peaceful protests by lawyers, teachers, and everyday citizens has devolved into a near-civil war.The hands of those fighting back are certainly not clean—there are credible reports of ambushes on military and police officers, kidnapping of local officials, and extortion of businesses for financial support—but what has allegedly happened at the hands of Cameroon’s most elite military force, and members of the country’s other armed forces, is far more alarming. Hard reporting has been difficult to come by and sporadic given the government’s grip on power and its tendency to cut off internet access in Anglophone regions for prolonged periods—150 days in 2017 alone. But for months, there have been widely circulated videos of individuals in military uniforms—both those of the Cameroonian army and those of the government’s elite military guard, the Battalion d’Intervention Rapide (BIR)—committing a vast array of violent acts against civilians, including burning dozens of villages in Anglophone regions, torture, and indiscriminate killing. In one video, men in military fatigues can be seen setting village houses ablaze before walking away to let them burn to the ground. In one video, men in military fatigues can be seen setting village houses ablaze before walking away to let them burn to the ground. Another shows individuals in BIR uniforms beating a man with a two-by-four. And in July, videos surfaced showing military officers executing women and children. After initial cries of “fake news,” the government ultimately acknowledged its veracity. Sadly, these are not anecdotes; there is a vast library of documented atrocities—and with presidential elections less than a month away, the violence is likely to get worse. The conflict in Cameroon’s English-speaking regions is rooted in the country’s colonial past and path to independence, and it cannot necessarily be resolved by outside powers. But the U.S. government could put a unique type of pressure on Cameroon’s leaders simply by enforcing U.S. laws already on the books. The so-called Leahy Law, passed in 1997 and named for its chief advocate, Democratic Sen. Patrick Leahy, essentially bars the Departments of State and Defense from providing military assistance to foreign security forces that have credible accusations of human rights violations made against them. From a growing number of press reports, firsthand accounts, and on-the-ground videos, it’s clear that the BIR and the military more broadly are violating Cameroonians’ human rights. From a growing number of press reports, firsthand accounts, and on-the-ground videos, it’s clear that the BIR and the military more broadly are violating Cameroonians’ human rights. These are exactly the types of forces the Leahy Law was designed to target. The BIR has always been a bit of an outlier when compared with its counterparts from other branches of the armed forces: It’s well funded, receives training from the United States, and is led by a retired Israeli military officer. The BIR doesn’t even report to the country’s defense minister, taking orders instead directly from Biya. My first encounter with them was on the day of the last presidential election, in 2011, when I lived in the country’s Northwest Region. While the casting of ballots was a mere formality—apart from in 1992, the first multiparty election, Biya has won every time by massive margins—the day still had an eerie feel to it. Every shop was closed, and only a handful of bars dared open their back doors to allow regulars an opportunity to pass the time with a drink. Meanwhile, dozens of BIR soldiers paraded through the streets in full riot gear, carrying sophisticated weapons. This isn’t the first time Cameroon’s military has been in the spotlight for unsavory reasons. In 2016, before the current conflict erupted, Amnesty International accused the BIR of vast human rights violations. The investigation alleged that more than 1,000 people, many of whom were arrested arbitrarily, were held in horrific conditions in Maroua Prison, located in the north of the country. The report alleged that eight people were dying per month due to malnutrition, disease, and torture. This is precisely why it’s time to invoke Leahy’s law. For years, the U.S. government has been giving several forms of security assistance to Cameroon. According to the Security Assistance Monitor, the United States has dished out more than $220 million in military and security funding to Cameroon since 2012, via the State Department and the Pentagon. But rather than use this funding as leverage to force Biya to de-escalate the conflict in Anglophone regions and put an end to rampant human rights abuses, the Trump administration is remaining depressingly mum. But rather than use this funding as leverage to force Biya to de-escalate the conflict in Anglophone regions and put an end to rampant human rights abuses, the Trump administration is remaining depressingly mum. In May, a Pentagon spokesman evaded questions about the checkered reputation of forces being trained and equipped by the U.S. government, despite his comments coming just days after the U.S. ambassador to Cameroon stated that he believed military personnel were carrying out targeted killings in the country’s English-speaking regions. New reports show that more and more BIR forces, most often associated with the fight against Boko Haram in the north of the country, are being redirected to Anglophone regions, leaving open the possibility that forces directly trained by U.S. officials for an important counterterrorism operation are now being diverted to a domestic campaign of repression that has left hundreds of civilians dead and tens of thousands displaced. The same Pentagon spokesman even conceded this possibility by saying that the Cameroonian government is free to move its assets as it likes, setting up a situation where an elite force trained by the United States in order to pursue U.S. security interests can be moved on a whim to put down domestic unrest in a manner that harms, rather than helps, U.S. interests in the region. This wouldn’t be the first time Washington has enforced the Leahy Law. Just a couple of years ago, Congress agreed to review Nigeria’s exclusion from U.S. military aidThis wouldn’t be the first time Washington has enforced the Leahy Law. Just a couple of years ago, Congress agreed to review Nigeria’s exclusion from U.S. military aid based on the Leahy Law. Countries from Pakistan to Indonesia have been subject to review under its terms in the past. There’s no reason why Cameroon shouldn’t be held to the same standard. Critics of U.S. foreign policy are quick to count every penny going to humanitarian aid or development projects, but the billions of dollars that support questionable leaders and armies around the globe, sometimes directly enabling human rights violations, are far too often overlooked. U.S. policymakers are in a unique position to demand changes to the conduct of Cameroon’s military, and all they need to do is follow rules that are already in place.